If you’re curious about what the 10th Anniversary iPhone might look like this fall, then there might be some hints in the new iPad Pro. The most enduring iPhone rumors suggest that Apple is coming for the bezel, and the new iPad might just be a precursor to that massacre. Apple’s killed the 9.7-inch iPad, but announced a new 10.5-inch iPad, that will have the same footprint with a lot less bezel. 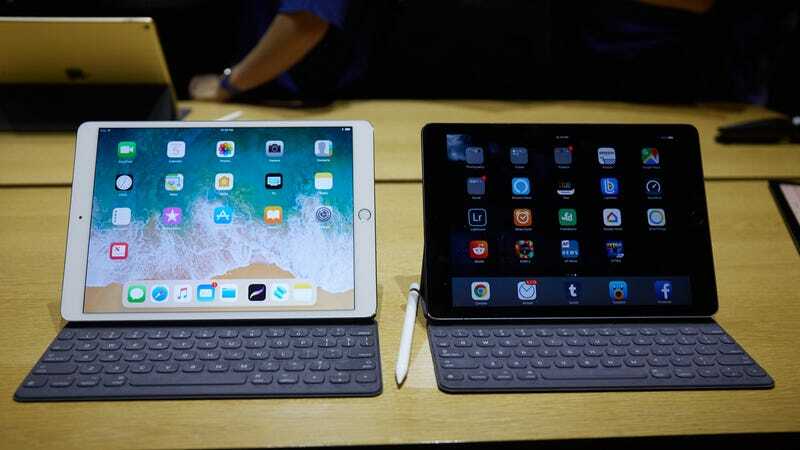 Besides shaving off the bezel, and thus making it impossible to grip in portrait mode, Apple claims the new iPad is 30 percent faster with an A10X CPU and 12-core GPU, and a display with a 120Hz refresh rate. This, according to Apple, allows the iPad to behave more like a traditional computer than ever before, particularly when it comes to Pencil interaction. Apple demo’d fine, highly-detailed art creation that it claims wouldn’t have been possible on earlier iPads, as well as super smooth animations that it claims are the result of the 120Hz refresh rate. Older iPads, and most laptops, have a 60Hz or lower refresh rate. 120Hz means you can enjoy up to 120 frames per second in games, and it’s also what allows for more responsiveness when drawing using the Apple Pencil. Besides the better display, and improved guts, the new iPad Pro has a nicer camera—which you should never ever use at a concert—and up to 10 hours of battery life. Many bezels were sacrificed to make this iPad happen, and we won’t know if the exchange was worth it until we get our hands on one. They’ll be available for sale for $649 starting today and will begin shipping next week.